This weekend marks the end of the Mardi Gras season, which begins on January 6 and culminates in Mardi Gras Day (aka Fat Tuesday), on March 4 this year. We used to live in New Orleans, so our annual Mardi Gras party has become a tradition among our friends here in Delaware, many of them whom also lived in New Orleans when we did (we all met working at a DuPont plant in Louisiana, and DuPont's headquarters is here in Delaware, so many of us ended up back together!). I cooked all last week, our house is all decorated, we had our party last night, and on Tuesday we will go to another friend's house for another gathering of old Louisiana friends and our traditional Popeyes chicken dinner (yes, Popeyes is absolutely authentic!). First, we always order a carton of Zapp's Potato Chips from Louisiana a couple of weeks before the party. Zapp's are the most amazing chips you've ever tasted, with unique flavors you can't get anywhere else, like Cajun Crawtator, Cajun Dill (my personal favorite), VooDoo (my son's fave), and many more. They are made in a little Louisiana town called Gramercy, just north of New Orleans, and you can order them any time of year by clicking that link above or calling 1-800-HOT-CHIP. You won't regret it! Everyone looks forward to Jambalaya at our party each year, and it is a favorite among my family, too. This one takes a little more work, but it is well worth it. The recipe makes a big pot of jambalaya, so invite some friends over to share it! We usually make it with chicken and low-fat Andouille sausage, but you can make use any combination of chicken, sausage, and/or shrimp. Another classic New Orleans dish is Shrimp Etouffee. We don't usually make this one for Mardi Gras (it's harder to make a big batch for a large group), but we have it for dinner throughout the year. If you live somewhere where you can get fresh crawfish or even frozen crawfish tails, then you can substitute those for the shrimp. Either way, this is a delicious, simple dinner perfect for the cold weather we are still enduring! There's still time! Make or buy some Louisiana food and join in the celebration. Laissez les bon temps roullez! Laissez les bon temps roullez! indeed! Looks like you know how to celebrate!!! I'll have to try those chips sometime. Oh, it looks like you had a great spread! We have Zapps chips here in DC at Potbelly restaurants - I love their unique flavors! Happy Mardi Gras! What a great party! I never knew that Mardi Gras season started in January, I thought it was just Fat Tuesday. 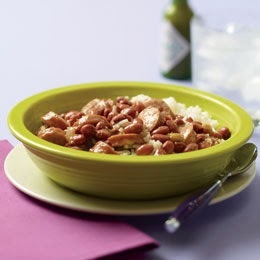 Those chips look tasty and I am going to try the recipes you shared for Red Beans and Rice and Jambalaya. I haven't made either one in awhile. I have two linky parties going on today, my usual Small Victories Sunday linky and I am co-hosting a Pinterest Party. I hope you will link this up to both! Hi from #ThrowbackThursday :) This looks like so much fun! I love Zapps chips as well. Like Cecelia, I've only had them from Potbelly too. I bet you had such a blast living in New Orleans and celebrating Mardi Gras! I love Popeyes, too, but I bet the original New Orleans is far better!! I found your post at #ThrowbackThursdaysLinkup!